LG Electronics is planning to unveil its first product built around the Google Chrome operating system at the International CES show in Las Vegas next month. 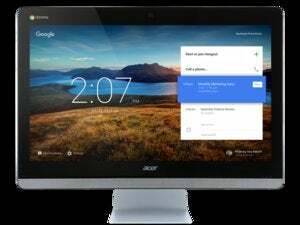 The all-in-one Chromebase desktop computer is targeted at consumers and business users, and is described by LG as “the perfect device” for taking advantage of Google’s online products such as Gmail, Drive, Search, Maps, YouTube, Play or Google+ Hangouts. Competitor Samsung Electronics is also offering the Chromebox desktop computer running the Chrome OS. Google described LG’s Chromebase as “an exciting new form factor” that widens options available to customers for the home, school or office. All-in-one computers integrate system components in the display case. LG hopes the Chromebase will be adopted not only at home, but in schools, hotels, call centers and other business settings, the company said in a statement Wednesday. The all-in-one will run on an Intel Celeron processor and will have a 21.5-inch Full HD (1920 by 1080) IPS display, 2GB of memory, and 16GB of integrated SSD storage, LG said. The pricing and availability of the device was not disclosed. It also features a 1.3 megapixel webcam, a microphone for video calling, a pair of built-in 5W speakers, keyboard and mouse, besides HDMI-in, LAN and USB 2.0 and 3.0 ports. The CPU, though not one of Intel’s most powerful, has the processing power to enable the LG Chromebase to handle Web apps, games and graphics with ease, LG said. The company had in October filed for three trademarks for computers that included the word Chrome, suggesting that its first product based on the Chrome OS would arrive soon. Google said it was glad to welcome LG to the Chrome family.